Complex Says: Sir Jackie Stewart's horrible accident at the 1966 Belgian Grand Prix spurred the advances in F1 safety and medical care that considerably reduced the inherent risk of the sport. He flew off the track, in pouring rain, at 165mph. Unlike today's racing, there was no run-off area or tire barrier to slow his progress. Instead, he slammed into a telephone pole and a shed before stopping in a farm building. Steering wheels at the time couldn't easily pop out to let a driver escape. 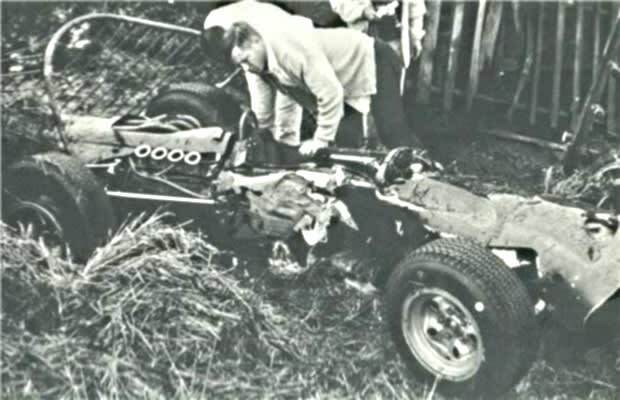 Stewart was trapped beneath his steering column, sitting in fuel that had leaked into the cockpit when fuel cells were punctured in the crash. Every minute he sat waiting to be rescued was a minute closer to the fuel possibly lighting on fire. A full 25 minutes after the crash, Stewart's rescuers managed to pull him out and load him into the back of a rickety pick-up truck for a ride to the hospital. At the time, they thought he had spinal injuries, making his rescue vehicle seem even more woefully inadequate. Stewart went on to become a vocal advocate for driver safety--and he won all three of his F1 World Championships after this accident occurred.